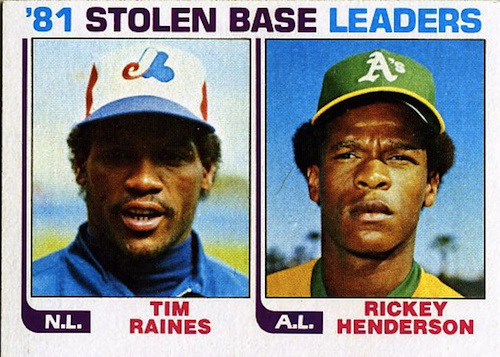 Right up front, let me say that I hope Tim Raines makes it on Wednesday when this year’s election results for the Baseball Hall of Fame are announced. All the early indications are that in his tenth and final year on the ballot (players used to get 15 years, but that’s no longer the case), Raines will finally top the 75 percent of votes needed for induction. It’s a strange thing. After waiting the required five years to qualify for the Hall of Fame ballot, what suddenly makes a player worthy after being forced to wait another 10 years? Many are saying it’s a triumph of the new voting rules that have phased out older sportswriters who are no longer actively covering the game. The younger writers are more open to modern statistical interpretations. solid physique earned him the nickname “Rock” at an Expos rookie camp. For a player like Tim Raines, who didn’t reach the big milestones such as 3,000 hits, younger voters are more likely to be impressed by the fact that when Raines’ hit total of 2,605 is combined with his 1,330 walks, he actually reached base more often (3,935 to 3,931) than eight-time National League batting champion Tony Gwynn. (Gwynn’s lifetime batting average was .338 to Raines’ .294, but his on-base percentage is .388 to Raines’ .385) . 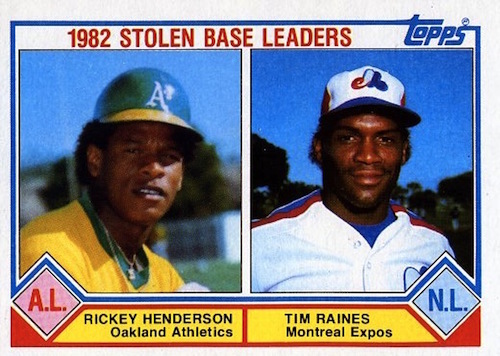 And though Raines’ career total of 808 steals is well behind all-time leader Rickey Henderson’s 1,406, the fact that Raines was caught only 146 times to Henderson’s 335 means Raines’ success rate of 84.7 percent is better than Henderson’s (80.8). It’s also better than the only other players from the 20th Century who had more steals than Raines: Lou Brock (938 / 75.3%) and Ty Cobb (897 / incomplete data). In the New York Post recently, baseball writer and Hall of Fame voter Ken Davidoff said, “Raines’ admittance, if it happens, would serve as a triumph of facts and statistics over emotions and memories.” But, as Richard Griffin in the Toronto Star has written (and I’m paraphrasing), “if all you did was feed the numbers into a computer, it would be easy to decide who makes it in.” Obviously, statistics play a huge part in this, but I, for one, would hate to see memory discounted entirely. For example, I know that Jack Morris didn’t put up the career numbers of recent Hall of Fame pitching inductees like Pedro Martinez, Randy Johnson, Greg Maddux, Tom Glavine and John Smoltz. But I watched him pitch his whole career; hating him as a Tiger, impressed by his one year as a Twin, and then amazed by his 1992 season in Toronto. Yes, he had a 4.04 ERA that year, but he was every bit as good as his 21-6 record indicates. When he needed to shut you down, he did. His complete-game, four-hitter 4-0 win over Boston on June 11, 1992, when he outpitched Roger Clemens (and yes, I remember it well … but I had to look up the date!) was a masterpiece. Though he never received more than 67 percent of the vote in his 15 years on the ballot between 2000 and 2014, for me, Jack Morris is a Hall of Famer. 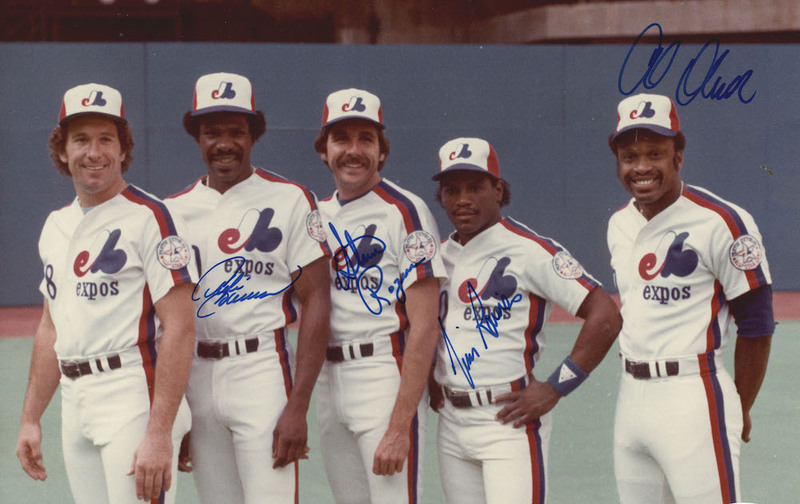 As for Tim Raines, my thoughts are this… In the first 13 years of his career (basically 11 full seasons) with the Expos, he was definitely a Hall of Fame-calibre player. He was the kind of guy, like Roberto Alomar, that when he was at the plate, you expected something good to happen. But I’m not sure fans of the teams he spent his final 10 years with (mainly the Chicago White Sox and the New York Yankees) felt the same way. Sure, he was a good teammate and a good role player, but as a Blue Jays fan in those years, I don’t recall having any fear of him coming to the plate like the excitement I’d felt when he was batting for the Expos … although he did put up some pretty good numbers against Toronto in the 1993 American League Championship Series. All in all, I’d say for Tim Raines the good years outweigh the mediocre ones, but this has to be a big reason why his candidacy has gone right down to the wire. Another reason, so I’ve read, is that some writers have refused to vote for him because of his cocaine suspension. To me, that’s ridiculous. How can you hold it against someone who served his time, kicked the habit, and never relapsed? Which brings us to Roger Clemens, Barry Bonds and others of the steroid era. If I had a vote, I’d vote for them. Do I wish there was no such thing as drugs in sports? Yes. Still, I think the world has been pretty hypocritical about performance enhancing drugs. Athletes have been using whatever they could to get an advantage for a very long time. Caffeine to get up; nicotine to calm down; oxygen; cold medications; amphetamines. What is it that makes a guy a hero for taking a shot of cortisone and playing through the pain versus a guy taking a shot of something else? Yes, I know it’s illegal to use one without a prescription. So, that’s where we draw the line? But what makes something a medical miracle and something else an abomination? Why isn’t it cheating to take a tendon from a cadaver, or another part of your own body, and sew it into a pitcher’s elbow? What if doctors could figure out a way to do the same thing with muscles? Would THAT be cheating? We certainly don’t say pitchers can’t have Tommy John surgery because is wasn’t available in the old days. We don’t say today’s hockey players can’t have their knees scoped because they didn’t have that medical advancement in Bobby Orr’s day. We’re pretty quick to jump on professional athletes who we perceive as not trying hard enough. But we seem to be even harder on the athletes who felt they had to take drugs to be the best they could be. What if Bobby Orr could have taken a shot of something and it saved his career? Would we look back on it as cheating … or would we see it as one of the greatest athletes of all time doing whatever it took to stay at the top of his game? Maybe using performance enhancers are like stealing bases. It all depends on whether you get caught. Good luck, Rock! Really interesting to read your viewpoint on these issues! I liked him when I followed the Expos and I would vote for him too. GREAT stuff! Tim Raines is 100% a Hall of Famer! He should have been IN long ago. A number of players whose careers, or a large part of whose careers, spanned the eighties, have suffered greatly from the ‘roids era phenomena which has stymied them from receiving their due. Dale Murphy is another who springs to mind. The ‘roids era phenomena was the oversight, historically, of players who, through the eighties and just in advance of the DAWNING of the ‘roids and PEDs eras of elevated personal statistics and overall for-the-records performances, artificially inflated the ‘norm’ of said stats and on-field production. The effect was this, by the time that players such as Raines, Murphy et al came up for eligibility for the Hall of Fame THEIR stats and for-the-record production, while up to and over ‘scratch’ as far as top-of-the-charts career, personal production in comparison to the ‘norms’ of their playing time and previous times paled in subliminal and even practical perception and comparison as coming up short when measured against those artificially elevated and exaggerated stats and production being recorded, documented and, for the while, accepted as the new ‘norm’ of the ‘roids era and the dawning of the PEDs travesty. Former MLB star and ex-Expo (1st round pick – 14th overall – by the Expos in 1991) Cliff Floyd, currently a MLB.com Network Analyst, stated today on PRIME TIME SPORTS with Bob McCown, citing currently accepted and employed metrics and stats, that Tim Raines ranks “8th” overall, MLB outfielder IN HISTORY! 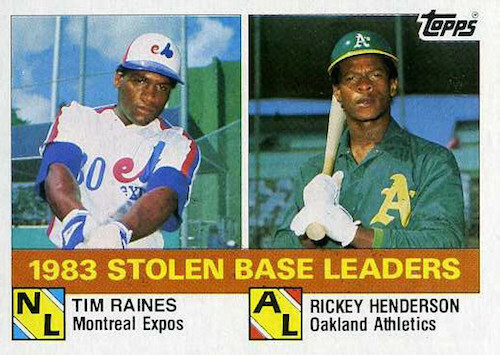 Wow Tim Raines was a ‘powerhouse’!!! No wonder they called him ‘ROCK’…small but mighty!! Thanks for a great blog post again Eric.